Polymorphonuclear neutrophils (PMN) are professional phagocytes and the first line of defense against invading microbes. Upon infection with Mycobacterium tuberculosis, PMN are attracted to the site of infection along an interleukin 8 gradient. In patients with active tuberculosis, PMN comprise the predominant population in the lung and carry the main mycobacterial load suggesting a minor role for PMN in protective host defense against M. tuberculosis but rather in pathology. Therefore, better understanding of PMN biology in tuberculosis is of pivotal importance to develop novel immune modulating measures and host directed therapies. Virulent M. tuberculosis escape the otherwise microbicidal armamentarium of PMNs by inducing necrotic cell death through the PMN’s own reactive oxygen species. Studying the interactions between PMN and different M. tuberculosis strains, and virulence factors thereof, is vital to comprehend tuberculosis pathogenesis. Working with PMN is challenging as these cells are non-adherent, motile and—with a half-life of 6–12 h in vitro—rather short-lived. 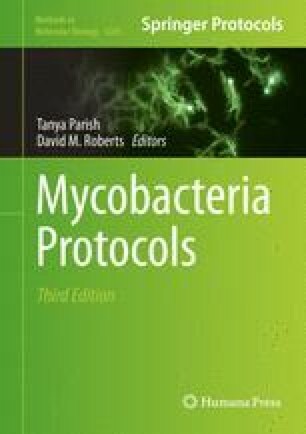 Here, we provide an isolation and infection protocol that is tailored to study mycobacterial infection in human PMN regarding the intracellular fate of mycobacteria and host cell responses, such as cell death and release of microbicidal effectors. This work was supported by DFG Priority Programme 1580 “Intracellular Compartments as Places of Pathogen-Host-Interaction” and the Research Center Borstel.